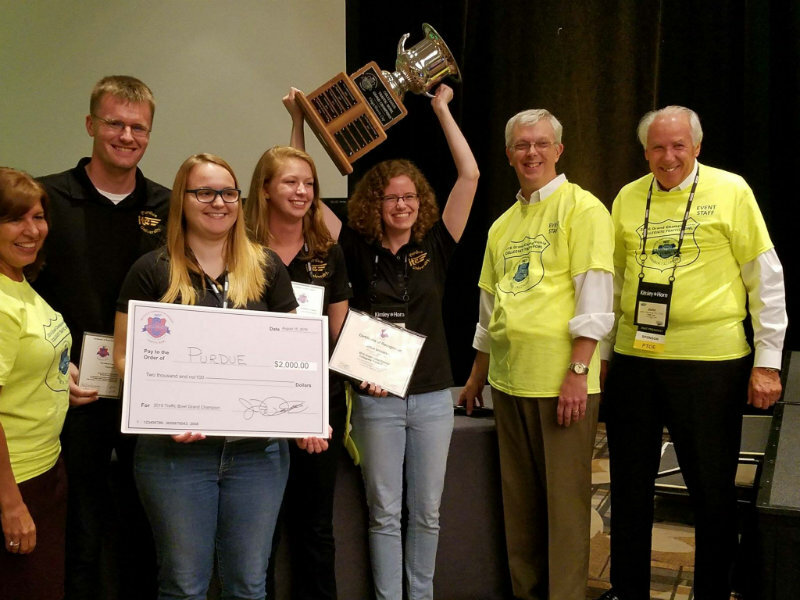 Congratulations to our Purdue Institute of Transportation Engineers (ITE) Traffic Bowl Team on winning the national ITE Traffic Bowl competition in Anaheim! This is an annual competition among ITE student chapter teams, and uses transportation planning and engineering topics for the clues, questions and answers. Our ITE team members are Maggie McNamara, Michelle Mekker, Thomas Hall, and Lucy Richardson. They are advised by Purdue Civil Engineering Professor and JTRP Director Darcy Bullock. The ITE Collegiate Traffic Bowl is an annual competition amongst ITE student chapter teams using transportation planning and engineering topics for the clues, questions, and answers. Of the ITE student chapters in the United States and Canada, a total of 100 chapters of all student chapters have participated in at least one traffic bowl since 2009. These teams have competed in section and district-level events. The winners of the ITE district competitions then compete in the Traffic Bowl Grand Championship, which is conducted annually at the Institute’s International Annual Meeting and Exhibit.